Time passes by too darn quickly watching my babies grow to ever want to live just ‘waiting’ for the future. I’d rather live in the here and now. Right now I live in the land of twilight cuddles, nursing, sweet milk breath, tiny hands, kicky legs, sleepy sounds, toddler nightmares, teething pain, cries in the night that I can calm just with my touch, my presence. My bed is incredibly full right now, although the new addition of a single mattress next to our King has created the space we all needed to feel comfortable. I didn’t choose bedsharing first time around. My baby chose it and I will be forever grateful to him for forcing my hand. Second time around, we chose it from the start. Why? Because it feels so right for us. My babies have me promptly when they need me. I can be the parent I want to be through the night. It’s easy when we travel. My husband and I will have years of our bed to ourselves. I can wait for that. 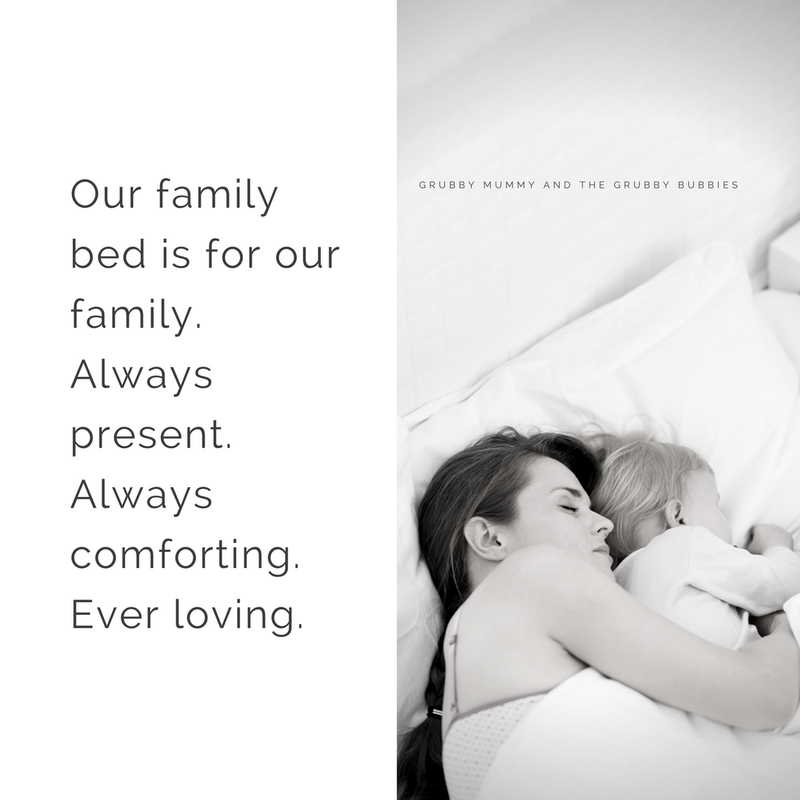 Right now, our family bed is for our family. Always present. Always comforting. Ever loving. Completely agree with you here! We can’t bed share properly due to my medical condition, bit our son sleeps in a cot right next to our bed so I can easily touch him and hold his hand. I love him being so close and he loves it too. I have had people tell me I’m crazy to have him with me now he is 7 months old, apparently he should be in his own room or “he will be still in your room at 15” as I’m often told! Ridiculous! He will stay with is as long as he needs to. I can’t imagine what my friends and family would say if we actually could bed share if they think I’m crazy for having him next to the bed! LOVE! That’s a phrase I hear all too often. Love your perspective, thanks for sharing.